Surfing is a dream state. Riding waves came to Bill in deep sleep, and, over many years, became indelibly imprinted in his subconscious. This has never stopped. The sensation of being one with the ocean was part of Bill in the 1950s when he began body surfing lonely beaches, free diving and spear fishing in the ocean. 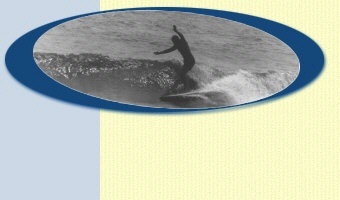 Seeds for Bill's surfing dreams were planted in an article on Hawaiian surf written by Bev Morgan for Skin Diver Magazine about 1960. Above photo by Bill of a hollow wave on a Delaware beach empty of surfers or sunbathers - early '60s. Hobie made Ole boards and shipped them East, not wanting to infringe on his Virginia Beach Hobie dealers, Holland & Smith. Later Hobie realized the two dealers were not in direct competition. 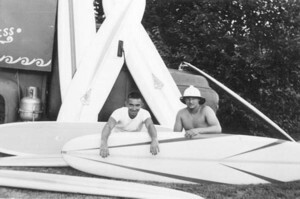 George and Bill then sold Hobie boards in their Eastern Surfer shops in Ocean City, Maryland, Rehoboth Beach and Harrington, Delaware. A hurricane 800 miles at sea pushed up sizable swells this autumn day . Bill was the only surfer in the water from Indian River Inlet south to the state line. At red ball road, so-called for a large buoy marking the road up to the dune line, Bill pulled in, grabbed his surfboard and camera. Only two sunbathers were on the beach. One of the girls shot an entire roll of film. This frame is the only one that turned out. All others were out of focus. George Feehley, Smedley, Dutch & Jim Phillips, checking jetty surf possibilities. Bill & George bought an old school bus, tore out the seats, installed racks, and filled it up with used surfboards for rentals. They leased the area from 93rd st to the Carousel Motel from Avery Hall for an annual rental of $500. 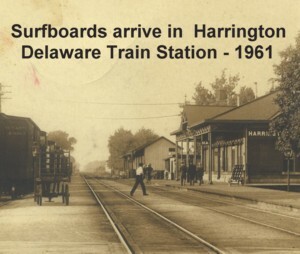 This became the official Ocean City, MD surfing area where The Eastern Surfer rented boards by the hour or day. Another underwater housing shot by Bill that appeared in Surfer Magazine. Unless otherwise attributed, all text and photos on this site were created, copyrighted, and the property of Bill Wise.